The world faces chaotic preparation for a return to 2006 after First Minister Nicola Sturgeon announced that Brexit is so cataclysmically destructive it will distort the space-time continuum to regress our universe a decade during a terrifying and unambiguous speech at Holyrood’s European Committee. 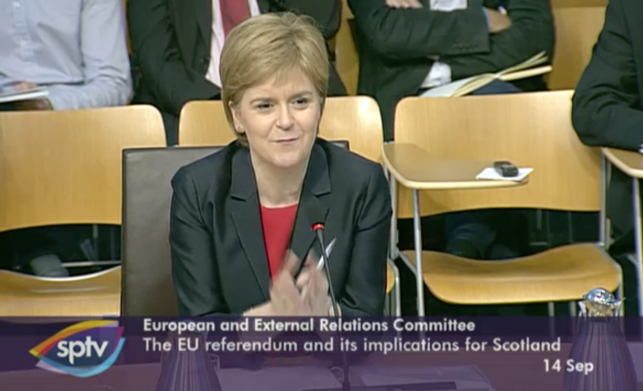 Speaking on the issue of the United Kingdom leaving the European Union, Ms Sturgeon – whose name derives from a species of fish found in North American and Eurasian waters – told the committee that she was “profoundly concerned” about the impending change, and that the country faces “a lost decade” due to a temporal anomaly she was presumably told about by a scientist. She also by extension accused Westminster of hiding this spatial shift from the nation, as she said that “a cloak of secrecy over the position of the UK government” is “untenable”, implying that the Theresa May and her kin are aware of the slip and are willing to let it go ahead like a bunch of Nero-esque baroque bastards. However, she has already stated that the process will go ahead without consultation from the House of Commons or anybody else who has been voted into their position democratically, and there are growing fears that the government will do the thing that they said they’d do if most people said they wanted that thing, which they did, and how. Brexiteers have urged Britons to seize the chance to “untangle” themselves from Lost this time. The regressive time travel this will cause is likely to create significant unrest, as it returns us to a reality when Saddam Hussein, Jimmy Saville and Jade Goody are still alive, but detractors have criticised Ms Sturgeon for being “selfish and agenda driven”, and accused her of only being concerned with losing her position, since Jack McConnell’s Labour would be back in office. Conservative pundit Terrance Highcastle said that Ms Sturgeon “claims to be focussing on today, but she clearly fears yesterday, when she wasn’t in charge” before adding “if she cared about representing Scotland’s best interests, she would welcome the chance to have a second go at qualifying for EURO 2008”. When asked for a follow up on her comments by The Daily Belter, Mrs Sturgeon claimed she had “no idea” what we were talking about, suggesting that she is now distancing herself from the prospect of becoming trapped in a world new and old, both ours and not at once, and going into a rather sad and alcohol-infused denial. The switch from 2016 to 2006, which will see The Scissor Sisters and Justin Timberlake’s Sexyback return to the top of the charts and put George W. Bush back in the White House, will realign reality with Dundee and give movie stars Robert De Niro and Al Pacino the chance to die with dignity.